Buying property in another country? In Spain, perhaps? If buying a holiday home in Spain is your dream you should keep reading this article. You will learn the rundown of everything you need to know before getting a Spanish mortgage. Why is Spain so Popular? If you're wondering why the people seem so interested in investing in Spanish real estate, the answer lies in the collapse of 2008. After the house market crisis of 2008, Spain was left with a surplus of unsold homes. But now that the economy seems to be improving, so is the housing market. And even though real estate prices won't go back to the way they were, Spain encourages foreign investors to purchase real estate. Since domestic buyers have not been purchasing real estate in high numbers, local laws have been more lenient with foreign buyers. So if you've always dreamed of owning a home in Spain for your holiday, this is good news for you. Although non-residents are able to buy homes in Spain, they can face more restrictions than citizens and residents. Second home mortgages are typically riskier, therefore, if you plan on buying a holiday home in Spain be prepared to put down 30 to 40 percent. How Do I Qualify For a Spanish Mortgage? Qualifying for a loan will depend on each institution. Typically, banks will take a look at your credit worthiness and also assess your expenses, and any other debts you might have. If you want to qualify for a loan, you need your total debts to stay below 35% of your earnings. Banks and other lending institutions will be tough to make sure you can afford to pay your mortgage. How to Start the Mortgage Application? Before you start the application, you should know which banks accept foreign applicants. Such banks are Banco Santander, Central Hispano, Banco Bilbao Vizcaya Argentaria (BBVA) and many others. You will have a better chance of getting approved if you begin your the application process early on. The mortgage process can only start after the sale agreement is reached, however, you can start the search early. While residents of Spain can borrow up to 80 percent of the value of a home, it's different for non-residents. Foreign buyers can borrow either 60 to 70 percent of the value of the home. This, however, depends on the lender. Some lenders decide the value of the mortgage based on the valuation of the home. 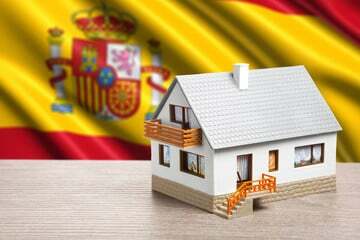 Getting a Spanish mortgage if you're a foreigner is not as difficult as it seems. Make sure you do your research, start the process early, and get ready to enjoy Spain. Ready to buy a holiday home in Spain? If so, let Right Casa help you. Click here to start the search.